Do you Need Food? We are here to Help! The mission of the No Child Hungry project is to help identify and fight food insecurity in Orange County. The following 2-item questionnaire can help identify individuals who are at risk of being food insecure if their response to both these statements are ‘yes’. 1. Within the past 12 months, we worried whether our food would run out before we got money to buy more. 2. Within the past 12 months, the food we bought just didn’t last and we didn’t have the money to get more. 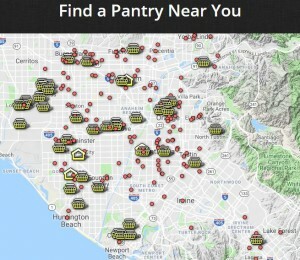 Once a food insecure individual is identified, we can help them by providing the services and resources to have food. The ‘Need Food?’ cards provide a simple and discrete way for individuals and families to find food resources via a text messaging system. NOTE: If you have unsubscribed to text messages by sending “Stop” to 80123, to resubscribe, please send “Start FOOD4U” or “Start COMIDA” to 80123. The No Child Hungry project began through a small, 18-month grant from national AAP’s Healthy People 2020 Grant Program to address Healthy People 2020 Objectives NWS12 (Eliminate very low food security among children) and NWS13 (Reduce household food insecurity and in doing so reduce hunger). Our goal is to identify food insecurity, poverty, and health issues experienced by our OC families, and to assist these families in getting the support and services they need. Coordination and implementation of 3 town hall meetings in different regions of the county experiencing high rates of poverty and food insecurity. It is our intention to create a replicable model of this project for use in other communities both within and outside of Orange County.